As in the past couple of years I’ve made a Mac OS X Dashboard widget to count down to the State of the Map conference 2010. SOTM 2010 Dashboard Widget and the Dashcode project source. This entry was posted in Mac OS X, Maps, OpenStreetMap, SOTM, SOTM2010 on April 17, 2010 by smsm1986. This blog post is only relevant if you are on Snow Leopard, have a 64-bit Intel Mac, and need to install ImageMagick. There are many Ruby on Rails projects out there that have some form image manipulation, thus use ImageMagick for that. Up until recently it was a real pain to install, with some huge list of library dependancies that need to be downloaded, compiled and installed. The ImageMagick project is now supplying a Intel 64-bit binary, specifically for Snow Leopard user so that they don’t need to install from source. This entry was posted in Code, Mac OS X, work on December 14, 2009 by smsm1986. I have updated the Dashboard widget I created last year for this years conference in Amsterdam, The Netherlands. I’ve added a donate button on the back that takes you to http://donate.openstreetmap.org/. This entry was posted in Mac OS X, OpenStreetMap, SOTM, SOTM2009 on February 23, 2009 by smsm1986. I don’t touch anything, and my slow first generation MacBook will randomly come up with the above message. Maybe an uptime of 13 days is the cause? It is about time I rebooted into Kubuntu to get some updated maps on to my phone for TMJ. There has some considerable improvements in the maps in Edinburgh, and I don’t know what actually needs to be mapped when I’m out in the field. This entry was posted in bug, Mac OS X, MacBook on April 1, 2008 by smsm1986. UPDATE:Thanks to Eric Bachard, a fix very similar to this will be appearing in OpenOffice.org 2.4.2 due to be released at the end of October 2008. With a change in the way that X11 works on Leopard, the X11 version of OpenOffice.org has been giving an error message on startup saying “command timed out”. With previous versions of Mac OS X, OpenOffice.org had to make sure that X11 was running first be trying to start OpenOffice.org. set theCmd to "sh " & (quoted form of (POSIX path of getOOProgramPath() & "soffice")) & " "
set theEnv to "DISPLAY=" & theDisplay & " ; export DISPLAY; "
Please comment on how this works for you. This entry was posted in Apple, AppleScript, bug, Mac OS X, OpenOffice on March 30, 2008 by smsm1986. The release of OpenOffice.org 2.4 (X11 version) is a little behind the other platforms due to a lack of resources in the QA process, as many of the resources have been placed on the upcoming aqua version. It will be another few days to week before they are available on the mirrors and the Mac Port download pages will be updated at that point. Until then the new smart download pages will continue to give the link to the 2.4.0 build which isn’t yet available. UPDATE: OpenOffice.org X11 2.4.0 for both Mac OS X 10.4/10.5 PPC and Intel are now available from the Mac Porting Download pages. This entry was posted in Aqua, Download, Mac OS X, OpenOffice on March 27, 2008 by smsm1986. Head over to the OpenOffice.org Mac Porting web site for the latest development build. This is the most stable build of OpenOffice.org running natively on Mac OS X that I have seen. I haven’t yet had a crash with my basic usage. Mac OS X 10.4 or 10.5 is required. Real version number is shown in the Mac OS X Finder’s Get Info Window. The downloads are on the extended mirror network, and BitTorrent. Please don’tdirectly link to any of the mirrors, please link to the OpenOffice.org Aqua download page instead. OpenOffice.org 2.4 (X11), is currently in testing. OpenOffice.org 3.0 will be Aqua only. This entry was posted in Aqua, Mac OS X, OpenOffice on March 19, 2008 by smsm1986. In Leopard, if the developer allows certain types of file to be opened, then you get a free iLife browser in the file open dialog. This applies to OpenOffice.org aqua on Leopard too. As the X11 version of OpenOffice.org doesn’t have a native filepicker, this won’t be available there. Those who have played with the latest OpenOffice.org aqua builds, you will find that you get an open dialog like the above one, without any way to select any files. This is a known bug. 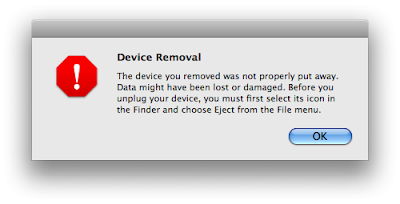 You simply cancel and open the dialog again to workaround the issue, until the fix is found and integrated. This entry was posted in Apple, Aqua, Leopard, OpenOffice on December 30, 2007 by smsm1986. After reading a macnn article. I have now found out that the BBC’s Player is now supported on Mac OS X. It is great that I can now watch BBC content from within Safari. The player only has a short buffer, though you can jump to any part of the video and it will start playing from there with very little delay. You have to remember that I have an internet connection of about 7Mbit downstream and around 0.8Mbit upstream. Therefore I don’t know how people on slower connections will manage. with no explanation as to why. Maybe some videos are not updated to the adobe flash video type. Now I’d like to get an improvement to Space, that will allow me to make a window in any application to be front most and move between space as required. That way when I’m playing a video the window will always show. Another problem that I have found with spaces is that when switching apps with command+tab or clicking the icon in the dock, a random window usually comes forward. This entry was posted in BBC, iPlayer, Mac OS X, Video on December 13, 2007 by smsm1986. Mac OS X 10.5 Leopard was launched by Apple Inc. about one month ago. OpenOffice.org, with the exception of the Java features will work on Leopard. If you require the Java features of OpenOffice.org on Leopard, you require to use milestone m237 or later. Thanks should go to Florian, Philip and Eric Bachard for their work on this issue. 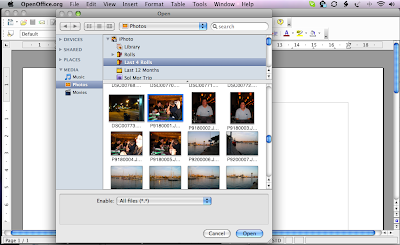 This entry was posted in Leopard, Mac OS X, OpenOffice on November 30, 2007 by smsm1986.